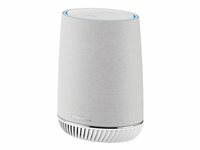 Orbi Voice combines an incredible sounding speaker with modern Wi-Fi technology. It has plenty of inner beauty, like a front-facing woofer & far-field voice technology. Orbi Voice is a powerhouse of sound and Wi-Fi wrapped in innovation and good looks.